You notice when shopping for electronic cigarettes that e-cig companies fall into one of two cartridge camps. They either sell a host of nicotine juice varieties or they stick with traditional ones. Traditionalists are targeting people who are reluctant to give up smoking analog cigarettes, not an audience of young, new smokers. Their style suggests they feel for people who crave the old cigs in spite of the fact that, when they vape, they taste more than just burnt tar. If you have been smoking for 20 years and are looking for an alternative to tobacco smoke, this company may be for you. 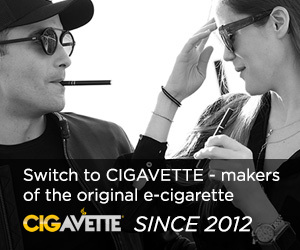 Cigavette provides just the answer with its simple menthol and tobacco flavors. Already there are plenty of items to choose from without sorting through ten to twenty choices of cartridges. Cigavette seems more interested in the electronic side of things. Their tobacco flavors are a nice neutral tobacco flavor, and have a decent throat hit. You select a white, black, or stainless steel battery with an LED “flame” simulation light of blue, red, or orange. Four starter kits of the same price represent one menthol variety and three strengths of tobacco. The other sort of starter package is called a “set” in the catalogue, but it is larger. You get two batteries, a wall charger, and 6 cartridges or more. There is very little difference between a fancy-flavored e-cig and an electronic hookah. Distinguishing between the two, however, allows Cigavette to categorize items for people with sweet teeth separately from tobacco lovers. Among six varieties are Watermelon Cooler and Peach Bellini. Enjoy non-toxic vaping with a non-alcoholic, zero-calorie fruit cocktail. The aroma will attract people, not repel them. A Cuvana e-cigar looks and tastes like a Cuban cigar. Marbled wood tones surround a cigar-shaped device of regular cigar size which will last for up to 2 years if you can extend approximately 1,800 puffs over that length of time. The Cuvana costs $29.95. Cigavette also carrries a couple of starter kits that have upgraded eGo batteries. These are pretty sweet as you can decide on a couple colors for the LED at the bottom, and the cartridges aree beasts, and last quite a bit longer than your standard type of e-cig cartomizers, and are significantly bigger.